I’ve decided to show you a few of the patterns or designers that I wish I had. Plus, this gives me the opportunity to clear out my wish list on Embroidery Central’s website. First up is Spirit Dancer from Butternut Road. 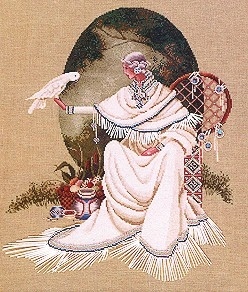 My husband’s grandmother has stitched this pattern and it is hanging in her apartment. I salivate over it every time I go to visit her. I really want to do this pattern or at least have it in my stash. However, I also tend to forget what is on my wish list and buy patterns that I need right now. I know that I am not the only stitcher who does this. This pattern will have to be on my wish list a little longer as the funds just aren’t there to support my habit. I know someday I will own it and someday I will stitch, it is just a matter of time and patience.